This story can be verified on snopes dot com. "...it can be pretty funny when you can't catch a three-legged horse." 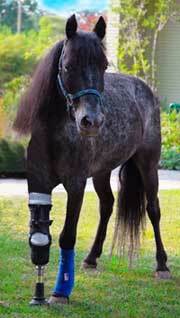 Molly is a gray speckled pony who was left to fend for herself when Hurricane Katrina hit southern Louisiana in 2008. After spending more than a month on her own she was eventually rescued and subsequently relocated to a farm where stranded animals were being collected for possible adoption or re-connection with previous owners. While at the facility, Molly was attacked by a pit bull terrier, and almost died from an infection in her right front leg. Her gnawed leg was planned to be treated by an LSU veterinarian but, as LSU was overwhelmed, and Molly would have been a welfare case so she was at the end of the list. Surgeon Rustin Moore met Molly, and he changed his mind. He was told how the pony was careful to lie down on one side and then the other, seemingly so she wouldn't irritate her damaged limb, almost showing intentional protection of her injured leg. She constantly shifted her weight, being careful to not overload her good leg. Everyone who observed her considered to be a smart pony with a serious survival ethic. Doctor Moore agreed to amputate her leg below the knee (transtibial) and a temporary, artificial limb was built. Molly walked out of the clinic on her prosthesis but, her story doesn't end there. Molly happened to be a one-in-a-million patient, this is a story about 'the right horse with the right owner,' Moore insists. She's as tough as nails, yet sweet, gentle, and willing to cope with pain. The horse appeared to make it obvious that she understood she was in trouble. The prosthetic has given Molly a whole new life, according to Allison Barca DVM, Molly's regular vet. Additionally, Molly will 'ask' for her prosthesis as she will come to you and extend her stump out, letting you know that she wants you to put it on. Occasionally, she even lets you know when she wants you to take it off as well. Sometimes, Molly gets away from Dr. Barca; it can be pretty funny when you can't catch a three-legged horse. Molly's story has become a parable for life in post-Katrina Louisiana, the little pony gained weight, her mane felt a comb and a human prosthesis service built her an artificial leg. Most important of all, Molly has a job now. Kay, the rescue farm owner, started taking Molly to shelters, hospitals, nursing homes, rehabilitation centers. Anywhere she thought that people needed hope. Wherever Molly went, she showed people her pluck. She inspired people. And she had a good time doing it. It has become obvious that Molly had a bigger role to play in life, Moore said, She survived the hurricane, a horrible injury, and now she is giving hope to others. She could be a symbol for New Orleans itself. The other important factor, according to Moore, is having a truly committed and compliant owner who is dedicated to providing the daily care required over the lifetime of the horse. This week, Molly the Pony, a children's book about the pony who has already inspired thousands of people around New Orleans, has been published. It's not a book about amputation or prosthetics; it's a book about people and ponies. 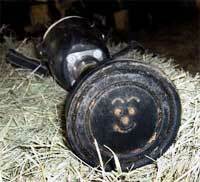 it disrupted the lives of not just human beings, but those of a variety of animals as well. Many pets, livestock, and other domesticated animals were left with no one to tend to them after their caretakers were killed, displaced from their homes (or otherwise separated from their animals), or left without the means to care for their charges. Some Gulf Coast area residents who came through the storm relatively intact (or were outside its range) began adopting animals that had been abandoned or separated from their owners, such as Kaye Harris, the owner of a pony farm in St. Rose, Louisiana. Through the efforts of an animal rescue group, Ms. Harris adopted an appaloosa pony (dubbed "Molly") found wandering in a pasture in St. Charles Parish and added the horse to the 17 ponies and other abandoned animals she was keeping on her farm. Unfortunately, a few months later a pit bull terrier (one of the other abandoned animals Ms. Harris had adopted in the wake of Hurricane Katrina) attacked Molly, ripping off her jaw, open a gash in her belly, and inflicting bad bites to all four of her legs. Horses that suffer serious leg injuries often have to be euthanized, and that initially looked to be Molly's fate, especially after one of her bitten legs became infected. However, rather than giving up, Ms. Harris turned to a close friend (and horse veterinarian), Dr. Allison D. Barca. Fitting a horse with a prosthetic leg was something that had rarely been tried and almost always resulted in expensive failure, but Ms. Harris and Dr. Barca pled Molly's case to doctors at Louisiana State University's (LSU) veterinary hospital. The doctors at LSU initially declined Molly's case, but after reconsideration they eventually amputated her right foreleg just below the knee and successfully fitted her with a prosthesis: Initially the doctors refused. But after observing Molly for a couple of days, Dr. Rustin M. Moore, the director of the veterinary school's equine health studies program and a veterinary surgeon, noticed that the horse would shift her weight and rest her good leg, and he became convinced that she would be a good candidate for a prosthesis. "She's very intelligent, and she knows how to take care of herself," Dr. Moore said. The doctors contacted a local company, Bayou Orthotic and Prosthetic Center, to see if it could build a limb for Molly. The company had never made a limb for an animal, but Dwayne Mara, who builds artificial limbs for the company, agreed to try. Dr. Moore consulted with the handful of veterinarians who had tried the operation, asking about technique and about complications. Mr. Mara watched ponies walk to see how their joints bent as they moved. He studied horse anatomy. He calculated how much weight the limb would need to support. In January, during a holiday break at the university, Dr. Moore and a team of surgeons amputated Molly's leg and fitted her with a hollow cast with a pole that she could use to balance. They knew almost immediately after the operation that it had been a success. "She went out and she went right to putting her weight on it," Ms. Harris said, "and I just cried because I knew it was going to work." The operation cost $5,000, and the prosthesis company did not charge for the artificial leg, Ms. Harris said.